Years ago as a teenager, I would struggle regularly with a bloated stomach, gas and often times cramping. Years later, in my early 20’s, I experienced severe cramping, bloating and full blown irritable bowel syndrome. Fortunately, I was able to discover the root cause issues involved in my digestive struggles and corrected them naturally. Unfortunately, so many people in our society today struggle with bloating. Some of the major triggers we can look at include poor diet, increased stress, exposure to toxins and medication usage. With so many triggers to a bloated stomach affecting us in our daily lives, it is easy to understand why so many people today struggle with bloating. Do You Experience A Bloated Stomach? Stomach bloat results from accumulated gas within the digestive tract that causes the stomach to protrude forward. This can make the stomach tender and painful. You may recall someone joking that they appeared pregnant when they were experiencing bloating. Unlike fat, bloating is temporary and doesn’t cause the gaining of mass around the stomach. It is simply the result of air compacted around the abdomen. People incorrectly assume that being bloated is just “water weight” or that it is caused from the storage of added fat mass around the abdomen. Fluid cannot buildup in the stomach but you may experience water retention in areas like your face, ankles or feet. Some conditions can cause both water retention and stomach bloating at the same time (4). Before you are able to relieve your stomach bloat you are probably questioning what causes the problem to begin with. Numerous reasons can trigger a bloated stomach from hormonal imbalances, thyroid dysfunction, allergies, gut dysfunction and many more. 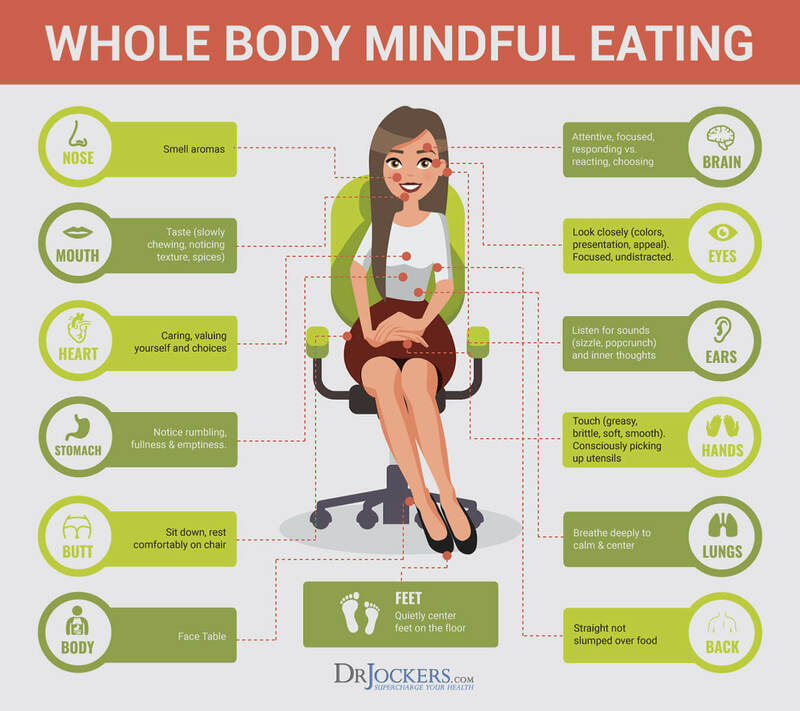 You will have a better understanding of what is triggering your symptoms by gathering information about the foods you eat and how your body feels after eating. Simply put, any digestive problem can cause bloating. Narrowing down the culprit of what is affecting your gut health can be complicated as different factors affect the digestive tract differently such as creating metabolic disturbances or suppressing the body’s natural elimination processes (3). Associating factors such as sleep and stress can affect you at any time of day and may not initially be the major triggers on your radar. Impaired ability to metabolize sugar and carbohydrates. Some people may be lacking the presence of specific enzymes needed to completely digest complex sugars. Incomplete protein digestion. This is often due to low stomach acid and can cause food to ferment in the gut. Imbalanced gut microflora. Trillions of “good” and “bad” bacteria compete for room and board in the gut. 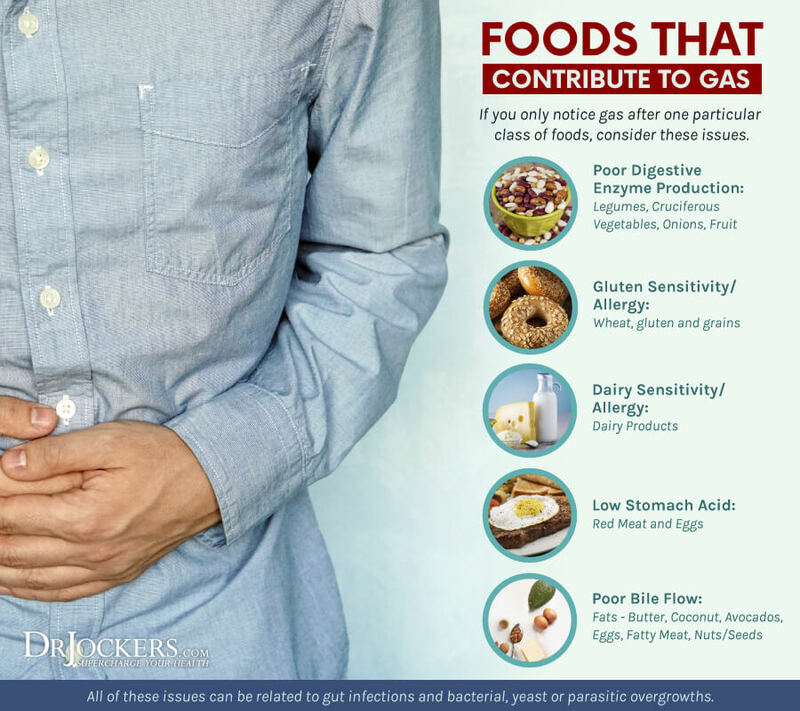 When the unhealthy bacteria are higher in presence than the healthy bacteria, excessive gas can result from this imbalance causing stomach bloat. Here are the 5 major causes of stomach bloating that I see on a regular basis. A bloated stomach may be a telltale sign that the gut is experiencing mechanical problems or simply not functioning as it was designed. Hypochlorhydria, or the condition of low stomach acid, may be triggering your digestive upset. Low stomach acid (HCL) can shut down sphincter activity, reduce digestive motility and lead to an array of side effects like heartburn. Under these circumstances food remains in the stomach and is susceptible to bacterial fermentation. Some bacteria are able to thrive in conditions of low acidity and metabolize the remnants of food, especially carbohydrates. This process results in GI upset including cramping, belching, acid reflux and bloating. Signs of low stomach acid may be accompanied by other symptoms including nausea, anemia, fatigue, food aversions, fowl body odor, and undigested food in stool (5). To learn how to improve the acid levels in your stomach, read my article here. One of the major bacterial infections which you may be tested for is Helicobacter pylori. H. pylori is a bacterial infection that inhibits organs responsible for secreting stomach acid and produces toxins that induce oxidative damage, inflammation and carcinogenesis (7). This bacteria is believed to be present in the majority of the world’s population and is a major cause of gastric inflammation and stomach cancer (6). Eating too quickly is another cause of low stomach acid levels and bloating. Food that is consumed without proper chewing aggravates the digestive process. 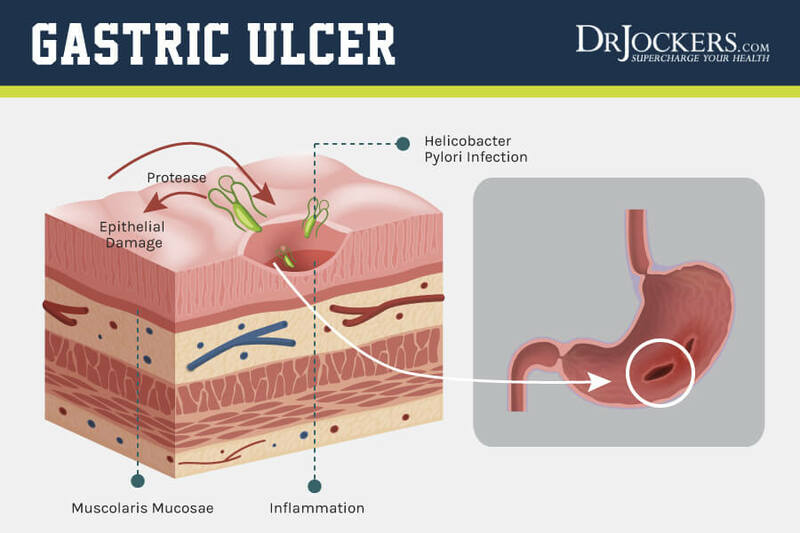 In circumstances of low stomach acid, the gallbladder and other organs cannot secrete adequate enzymes to metabolize food in the small intestines. This can further result in the accumulation of bacteria in the small intestine that have been introduced with food and have not been broken down from acid. Similarly, stress depletes stomach acid. When a perceived threat is detected, the body innately is designed to shut down non-essential processes to conserve energy. 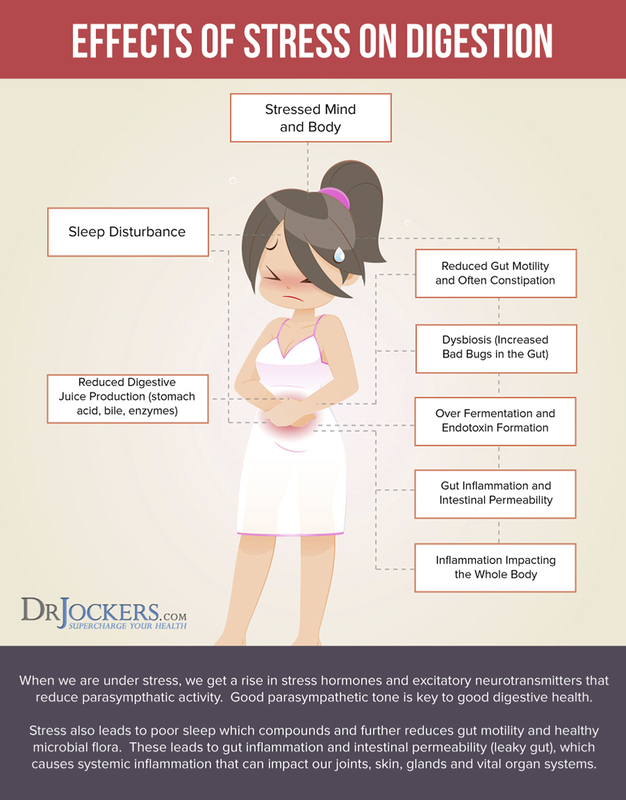 Remaining in a state of chronic stress, especially during and after a meal, can indirectly shut down digestion. When your gallbladder is malfunctioning you may experience intestinal upset including nausea, gas and bloating that is especially prevalent after a meal high in fat. Serious conditions can also be partly to blame for a slow liver and poor gallbladder function including fibromyalgia and hypothyroidism. To determine if your gallbladder is to blame for your stomach bloat, check to see if any of the following symptoms occur. These serious health problems can be limited if not avoided using natural healing strategies. Improving gallbladder health can be as simple as stimulating gallbladder function with bitter herbs like cilantro, turmeric, milk thistle and parsley. Consuming an anti-inflammatory diet high in medium chain triglycerides (MCTs) is also key. The presence of excess microorganisms in the small intestines produce methane gas and sulfur resulting in bloating and a variety of other digestive disturbances such as food intolerance, diarrhea, cramping and fat malabsorption (12). These complications may manifest as autoimmune diseases, diabetes, irritable bowel syndrome or disease, chronic fatigue syndrome, neuromuscular disorders and deficiencies in vitamin B12 and minerals such as iron and magnesium. 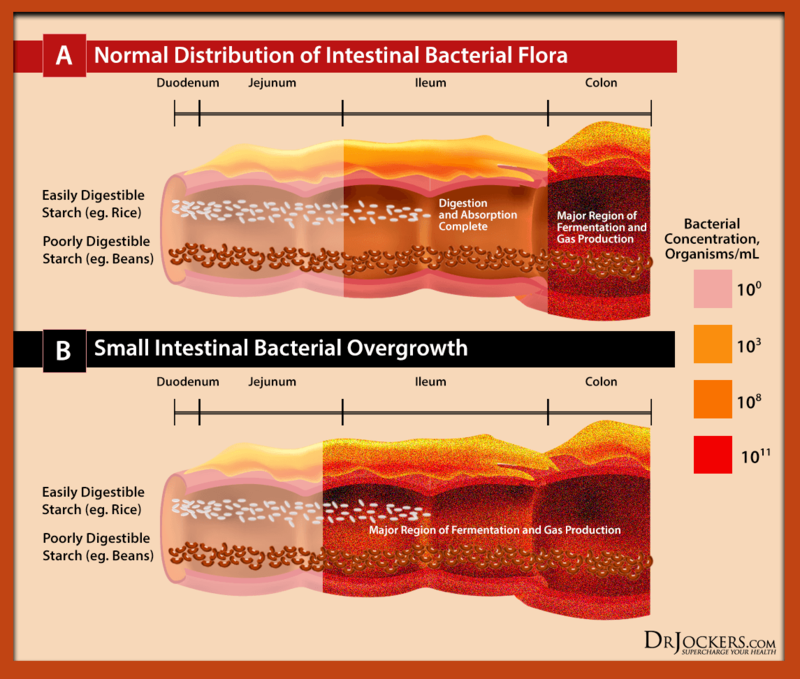 A variety of factors can disrupt gut microflora creating this imbalance of bacterial growth. If you have taken antibiotics, steroids or acid-blocking drugs (PPIs) you have an increased risk of developing SIBO (13). You may also be more susceptible to bacterial imbalance if you have damage or obstruction to the gut such as scarring or diverticuli (14). Learn how to test to see if you have SIBO and beat it naturally by reading more information on the topic here. To overcome Candida it is first necessary to control the Candida population and then restore the gut lining. 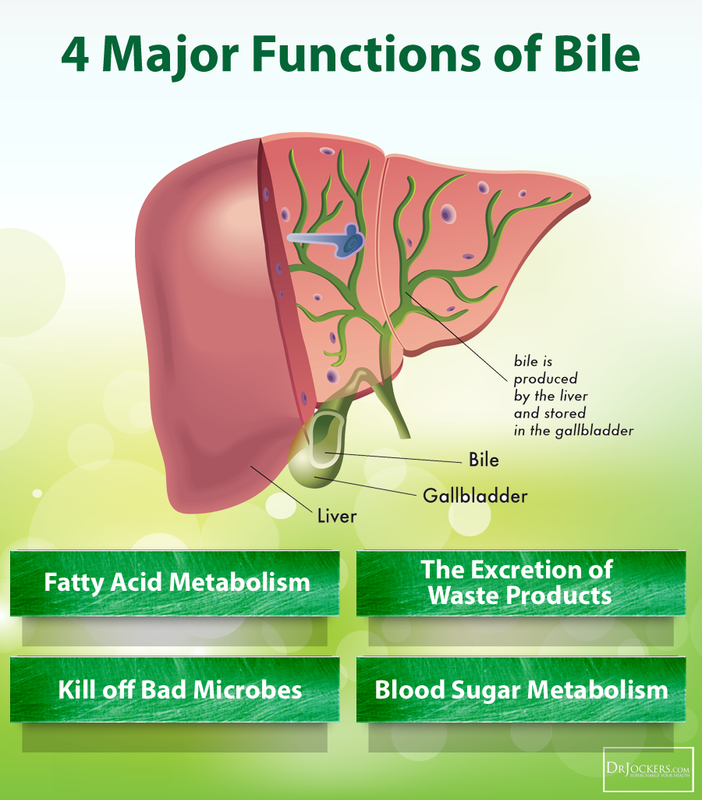 Bitter herbs are excellent to support the gallbladder because they aid in the detoxification of the liver. Healthy detoxification pathways are critical to remove accumulated toxins and boost the immune system which has been fighting overtime to defend against Candida overgrowth. Foods that contain anti-fungal and antioxidant properties such as coconut oil and green tea improve Candida levels and provide anti-inflammatory benefits. Avoid the root causes of candida overgrowth and learn more by reading my article here to naturally conquer Candida overgrowth. Abdominal bloating may be one of the first signs that you notice resulting from food sensitivity or intolerance. There is a plethora of symptoms associated with food sensitivities that are often unique in each individual. Journaling about your food consumption while practicing an elimination diet may be one of the best processes you can follow to determine what food sensitivities you have. The major food allergens include dairy, wheat, corn, eggs, gluten, soy, shellfish, and peanuts. Given that 70% of the immune system is compromised in the digestive tract, eating these foods can contribute to inflammation in the gut and other autoimmune responses such as skin rashes, weakened immunity and autoimmune disease (18). Inflammatory foods promote an imbalance of microorganisms like Candida and can trigger leaky gut syndrome. As particles from these foods leaks through the gut, the immune system must react to the allergen as it enters the circulatory system. This disturbance, also known as gut dysbiosis, can lead to metabolic complications such as obesity and insulin resistance (19). Don’t go your whole life assuming that your discomfort following the consumption of certain foods is normal. Learn which foods are causing you digestive upset by following these 5 easy steps to an elimination diet here and eliminate the cause of a bloated stomach. I have enjoyed reading your article about common reasons for bloating, especially the malfunctioning gallbladder. But I wonder what a person needs to do when they no longer have a gallbladder? If I knew this information 10 yrs ago I probably would have tried things prior to having it removed but I am basically getting the symptoms that you describe, yet can’t “help” my gallbladder since I don’t have one. What do you recommend? Do you see patients that have every digestive disease aka candida, disbiosis,Sibo, etc! I’ve been suffering for 10 years and I need real help. I would love your help! !